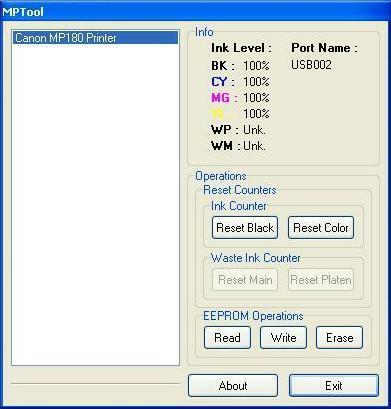 Download MPTool software to reset your printer Canon Pixma MP series. MPTool is global software resetter that support many printer series. The program is designed to reset printer Canon MP150, MP160, MP170, MP180, MP450, MP460. MP150, MP160, MP170, MP180, MP450, and MP460. There are many tools on the MPTool. The tools divide into three section. You can reset a printer counter, read or write EEPROM, and read full printer info. With many Canon MP series supported, it must have service tools to service for your Canon MP printer. Show complete information about the printer such as level of ink in the cartridge, waste of ink and connections. Clear the counters or reset ink level for ease just in one click. The latest version resetter can be download from following link. Its latest version MPTool software: Download the software. Important notes before download the software. MPTool is designed to run in Windows XP. You may need to set to comparability mode if run the software in Windows Vista or upper. 1 Responses to "Download MPTool Software Resetter Printer Canon MP Series"